Welcome to our second and final soap of the 2018 holiday soaping season—Christmas Tree Soap! These clean white bars feature an abstract Christmas-tree-inspired swirl down the centre and a topping of dancing mica swirls. 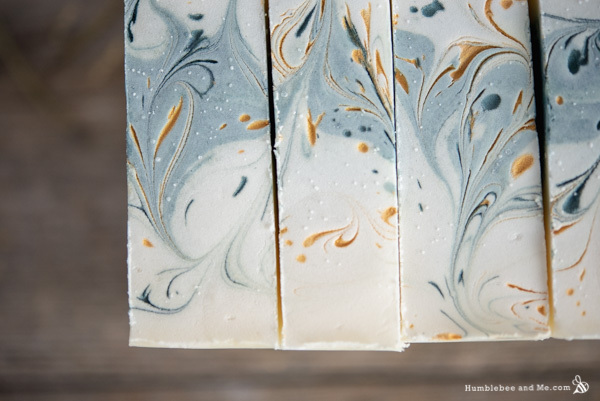 I had so much fun creating these bars, and the saponification anticipation was strong! I couldn’t wait to slice these bars and see how they’d turned out—and now I can’t wait to share them with you! Want to watch this recipe instead of read it? 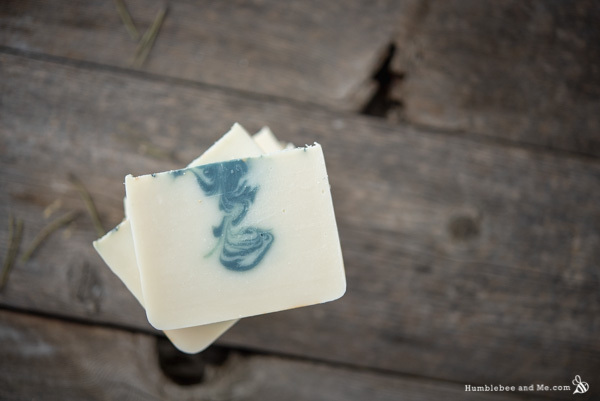 The visual inspiration for this soap was, unsurprisingly, Christmas trees! I was thinking about how coniferous trees look out in snow-covered fields; proud and green, surrounded by (and dusted with) white snow. With that visual in mind I made the bulk of the soap white and worked a swoopy, loopy dark green bit of abstract tree right down the centre of each bar. I considered doing something a bit more structured than a swirl, but In June I attended Zahida’s of Handmade in Florida workshop at the HBBG/HSCG annual conference in Toronto, and it was so inspiring! Watching her soap is so serene, and scrolling through her Instagram is just… wow. Zahida’s swirls are works of art and magic, and her work inspired me to have a bit more fun with hanger swirls. Watching the video is definitely the best way to see what I did, because it’s really hard to describe! In order to have a swirl-friendly batter I’ve kept the fat blend pretty heavy on liquid oils, at 40% between the canola and castor oil. 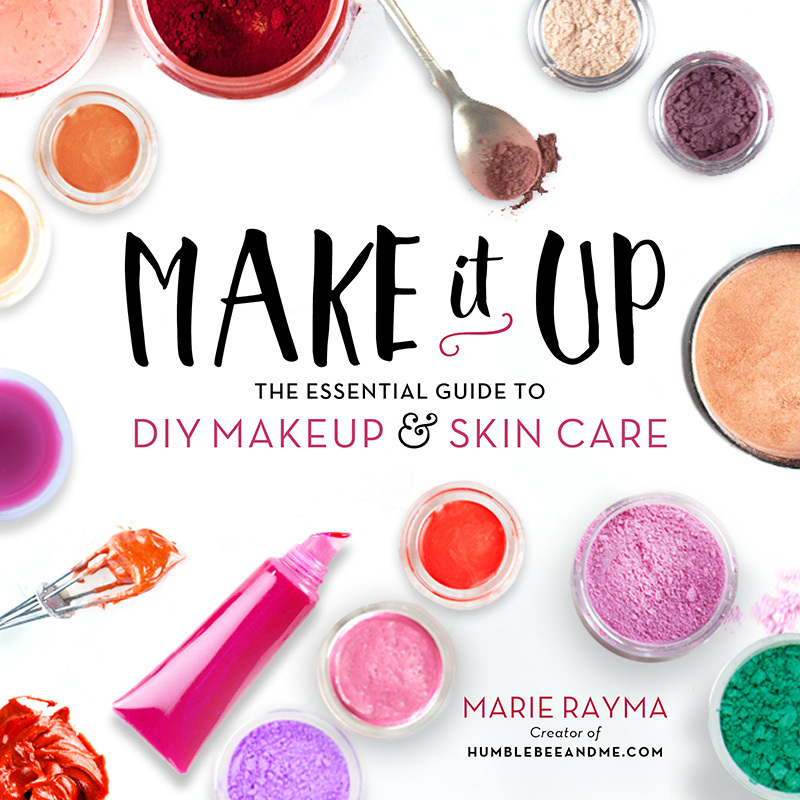 I’ve done previous blends that featured 50% liquid oils and I find those are really well suited to multi-layer soaps—the type of project where you bring each layer to trace individually and want to pour each layer at a watery-thin trace. For swirls we want a bit more body otherwise the batter mixes too much when we pour it (think of pouring cream into coffee), so I traded 10% of the liquid oils for some shea butter. Not only does this make for a richer final bar, but it also helps get a slightly thicker trace slightly faster. I used a fragrance oil to scent these bars—Christmas Wreath from Crafter’s Choice. It smells divine, with lots of spruce and fir and hints of spice, sugar, vanilla, and fresh air. I chose not to use pine/fir/spruce essential oils because, in my experience, no matter how much I use, those oils don’t stick around long enough to make it through aging. Not only is it very sad to have your amazing scent blend vanish into thin air before you can even use the soap, but it also feels very wasteful! If you don’t want to use a fragrance oil you can certainly use essential oils or nothing at all. If you are using essential oils, keep in mind that we want the bulk of the soap to be white, so I’d avoid anything too colourful like orange essential oil. You could also use a different fragrance oil—just make sure you read up on it to check and see if it can accelerate trace. 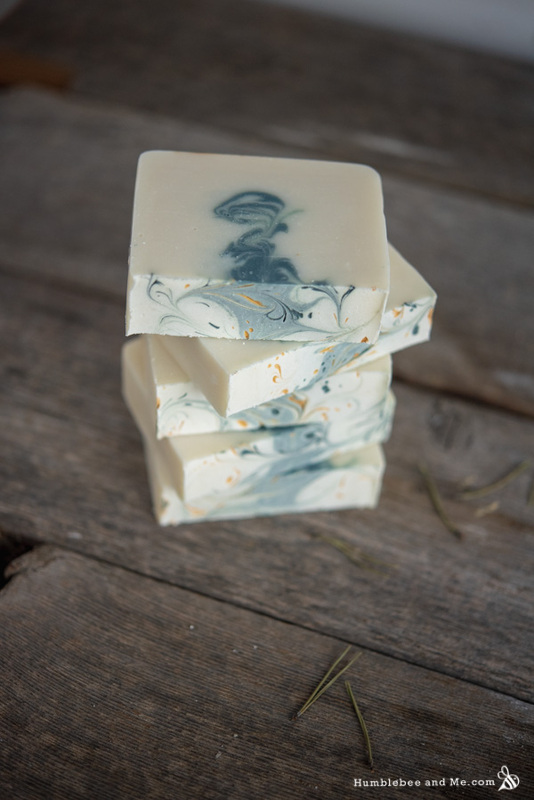 Our topping is a lovely tri-colour swirl, featuring some of the interior batter peeking through the surface of the soap and two micas. I pre-dispersed some gold and forest green mica in oil and scattered drops of those across the surface before swirling everything together with a toothpick. 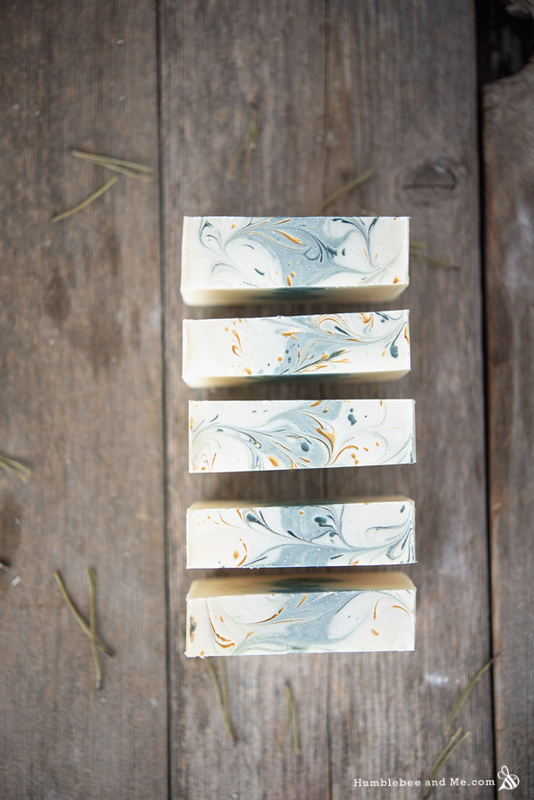 I love how the swirls turned out, but I definitely need to do a more abstract splatter-topped soap in the near future as I loved how the top looked before I swirled it! 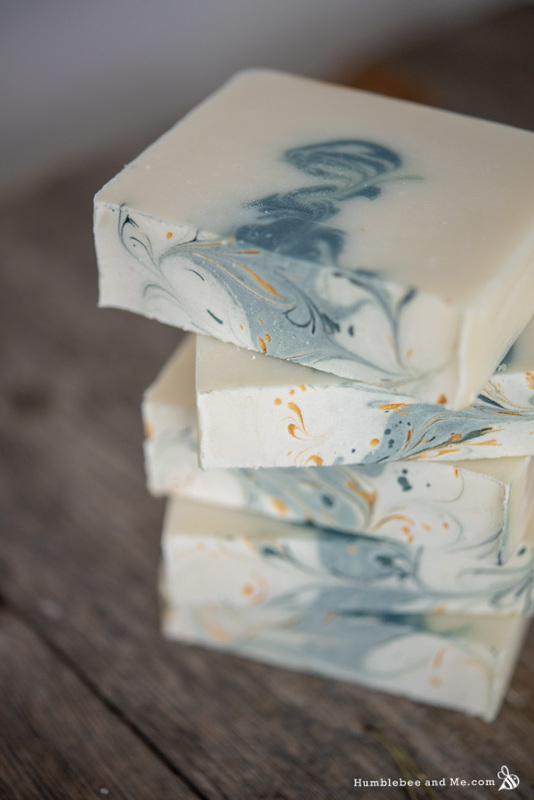 I find the finished bars to be quite serene, just like a walk through a snow-dusted forest in the winter. I hope you love them as much as I do! Kick things off by calculating out your recipe for the amount of soap you’re making to get the finite amounts of the fats, lye, and water. Unsure about how to use SoapCalc? I made a video to walk you through it! 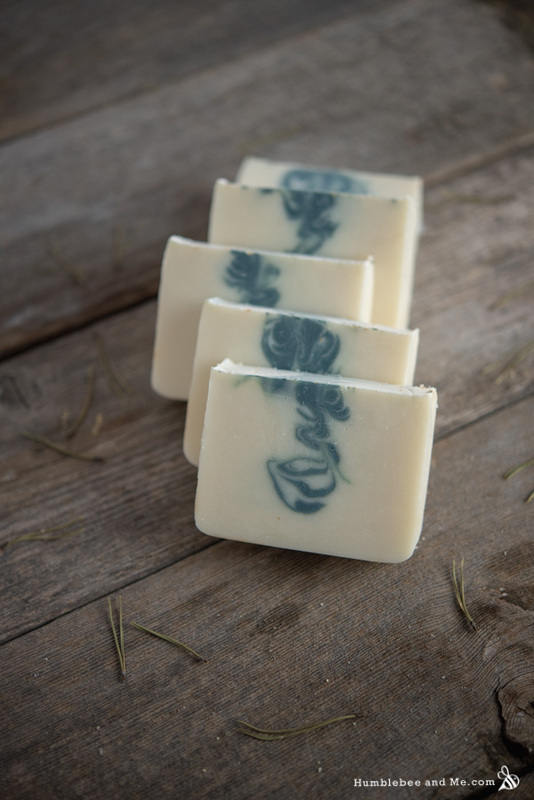 Please ensure you’re familiar with standard soap making procedure before diving in (click that link if you aren’t!). 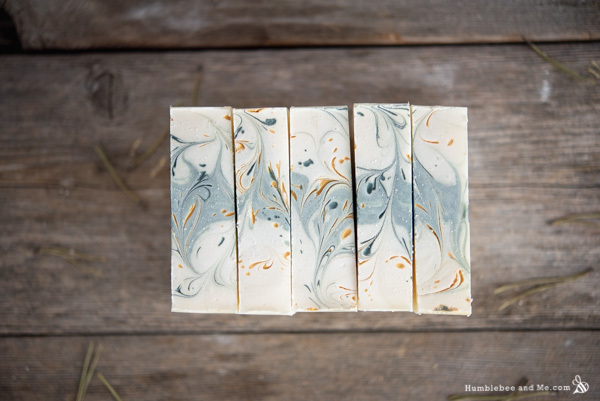 Prepare your mould—you’ll want a loaf mould for this soap. Melt your oils together in your soaping pot, and have a container with a pouring spout handy (I use these awesome funnel pitchers). Let your oils cool to slightly warmer than room temperature. Mix up your lye water and let that cool to just above room temperature (you can use ice for part of your water to speed up the cooling process). While everything is cooling, weigh out your fragrance oil, and pre-disperse the micas and titanium dioxide in a bit of extra canola oil. 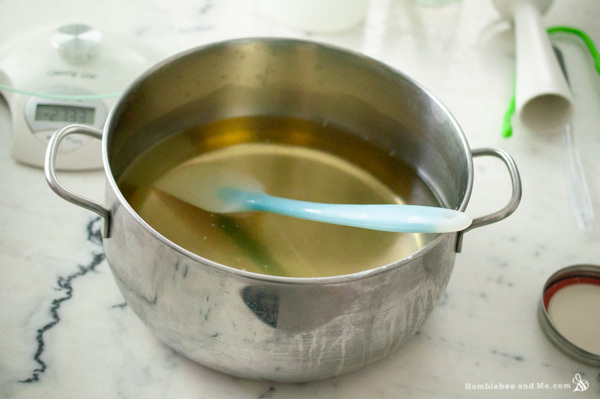 Once the melted fats and lye water are just slightly warmer than room temperature, blend the kaolin clay into the fats. Next, follow standard soap making procedure to bring them to trace. When you have a relatively thin trace, blend in the fragrance oil. Weigh out about 15% of the batter into a smaller container and use the forest green mica to colour that portion a deep green. Use the titanium dioxide to colour the large portion of batter white. Pour all the white batter into the mold, and then pour the green batter. Pour the green batter from a height of about 20cm (8″) in a single stream down the centre of the mold—the height will allow the batter to break through the surface of the white soap. As you pour back and forth, gradually reduce your pouring height until all the soap is in the mold. Now it’s time for the hanger swirl! It’s definitely best to watch the video to see what I did. You don’t have to try to replicate my swirl if you’ve got something else in mind, of course! The last step is decorating the top. Scatter drops of the pre-dispersed green and gold micas over the top of the loaf, and then swirl them (and the bits of green batter poking out) together with a toothpick. Once you’re happy with how everything looks, leave the loaf to saponify for about 48 hours. I did not insulate or cover mine. After two days remove the loaf from the mold and slice it up! I recommend slicing through the side so you don’t drag any mica topping through the bars with your knife. Leave to age for at least four weeks before using or gifting. Enjoy! 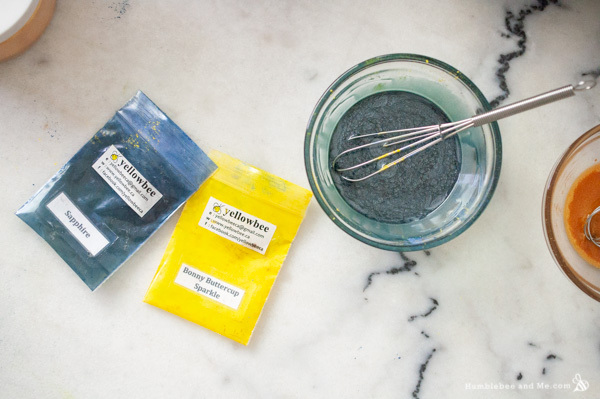 The Sapphire and Bonny Buttercup Sparkle micas were gifted by YellowBee. Did you enjoy this post? Take a second to support Humblebee & Me on Patreon! Sign up for the Humblebee & Me newsletter to get more recipes and exclusive email content delivered straight to your inbox! I'll never do anything dodgy with your email address and you can unsubscribe instantly whenever you want. Pinky swear. Such an elegantly simple bar, yet the speckles on top really make it something special. I am a little confused as to the “gold green mica”. Is there green in that gold? And did your soap go through gel phase? Thank you! The green-gold thing was definitely a typo, ha! I don’t believe it gelled. Now, I have to ask, how do you find canola oil in your soap? I’ve never worked with it, but a couple folks have talked about it in the EU Facebook soapers group and now my brain is thinking about it and I don’t know!!!! I agree that topping looks lush! And I would love to get my hands on that fragrance oil!!!! How do you find using that much canola oil? I was using 7% and it caused DOS I stopped using it and haven’t had a problem since. Do you use a particular brand or type? I’ve had some soaps made with even more canola oil (~45%) do perfectly fine for ~2 years, so no problems here. My canola oil is from Costco, ha—a massive, inexpensive jug that I am (somewhat obviously) trying to finish! That soap is gorgeous Marie! I really need to get into gear and make a Christmas Soap this year. I say that every year and never do it. This bar looks perfect, especially since I ordered a Christmas fragrance oil sampler from Brambleberry. They all smell divine and there are several that would be perfect with this design. Thanks for this, Marie. It went to trace very very quickly despite my cooling everything in the fridge for an hour before assembly. I wish I could post a photo of my effort which I’m very pleased with. It’ll be in Revelstoke for Christmas. Hi Marie, I’m interested in making this soap with lard rather than tallow (I have a bunch of lard in my freezer). Can I do a 1:1 swap by weight, and would that change the properties of the soap? 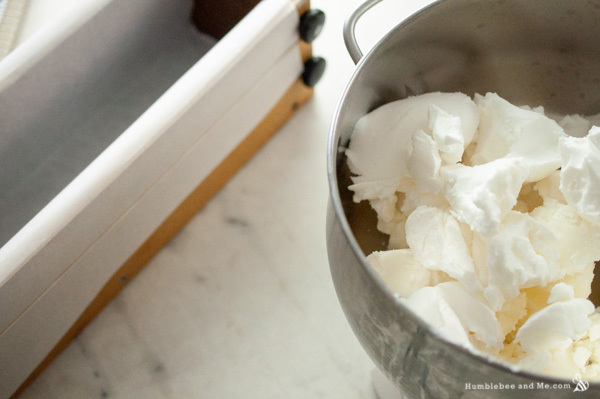 I looked through your substitutions guide and FAQs, but didn’t find anything on the differences between lard and tallow – are they interchangeable in soap? Hey! Yes, they are interchangeable, just be sure you’re calculating the recipe with lard instead of tallow and you’re off to the races 🙂 Happy soaping! Out of curiosity, how strong is the scent in the finished bar from that amount of fragrance oil? I really dislike strongly scented products, so am looking for something on the lighter side. Thanks! Before you comment (especially with questions about shelf life and substitutions), please read the entire blog post and check the FAQ! It's very likely you'll find your answer there in an instant :) If you have a question about a specific ingredient (including sourcing and substitutions), check to see if it's in the Encyclopedia—I've got loads of great information in there, too! Please note that questions that are answered in the blog post or FAQ are unlikely to be replied to. Sign me up for the Humblebee & Me newsletter! My lotion is either too thick, too thin, or it didn’t emulsify.